It’s time for our 2015 TTC Mug Exchange! Wooohooooo! Last time we had over 400+ ladies participate and it was a BLAST! All women in all phases of infertility (trying to conceive, pregnant, adopting, new mom, etc… more details on this below!) are invited to participate.I absolutely LOVE how all of these women come together to support one another and spread positive energy and love. Please note that while I will do my best to partner you with someone in a similar stage, you may be given anyone to purchase for. As this exchange grows, it has become increasingly more difficult to ensure that you get an equally appropriate match. My very best efforts are given! Just try to remember that you are encouraging another TTC sister no matter what their story is! Once you sign up and get the name of the person you are sending to (more details below), you will work to put together an exchange box for them, including a coffee/tea cup/mug. You will be given a “send-by” date and I ask that you respect that date unless there are extreme circumstances. You will send and receive a box to the same person. A note! Please include a card inside with a special word of encouragement for your new friend. Yep! We always have women from all over the world participate and I think that is what makes it so much fun! HOWEVER, you will only be assigned an overseas person if you agree to be open to shipping internationally. (More about that below). I do ask that if you live outside of the US, that you be open to shipping internationally, as many of the participants are located in the United States, however I know that sometimes that’s not an option and that’s okay too. If I cannot find you a partner I will let you know. You can get ANY kind of mug. Travel, big, small, delicate, clunky. It could be a cute mug from your local coffee shop, something you ordered on Etsy, bought at Walmart, or ordered off Amazon. There are SO many adorable mugs out there – be creative! Don’t put too much pressure on yourself – this can be a mug that you adore or that you think someone else would love. You will need to sign up no later than end of day Sunday, November 15th. That’s a good 10 days of time to sign up, spread the message and start brainstorming. You will then receive your exchange partner from me via email on either November 17 or 18 . (Because of the hours it takes to coordinate, I am not always able to get ALL the emails out on the same day. So if you see someone post that they got their person and you have not yet heard from me, it’s likely due to the amount of time it’s taking me to email everyone back individually. Do not panic!) Once you receive your person, you will have until Saturday, December 5th to put together your package and mail it out. Please make sure if you sign up that you are able to get your box out on time. This is the fun part! I LOVE seeing all of the posts where people show off their package! Post your mug to social media and tag it with #TTCMugExchange2015 so we can all peruse the pictures. Send a shout out to your person, blog about it, Instagram it, do whatever you want to celebrate this fun exchange! I do understand too that there are many women who are not publicly sharing their infertility journey with others so know that you don’t have to share it publicly in order to participate. The key thing is that we offer encouragement and support to one another, even if that circle stays small. I will close the exchange at midnight on the 15th (central time) and will not be able to accept stragglers after that. 2. Make sure you receive a confirmation page! This will verify that your entry has been received. If you need to make changes after it has been sent, please email me at ttcexchange @ gmail (dot) com. 3. Share! Let your friends know about the exchange! You can share my blog or instagram account so that they can find out more information. I feel awful when someone finds out “too late” and can’t participate so help me make sure no one gets left out. 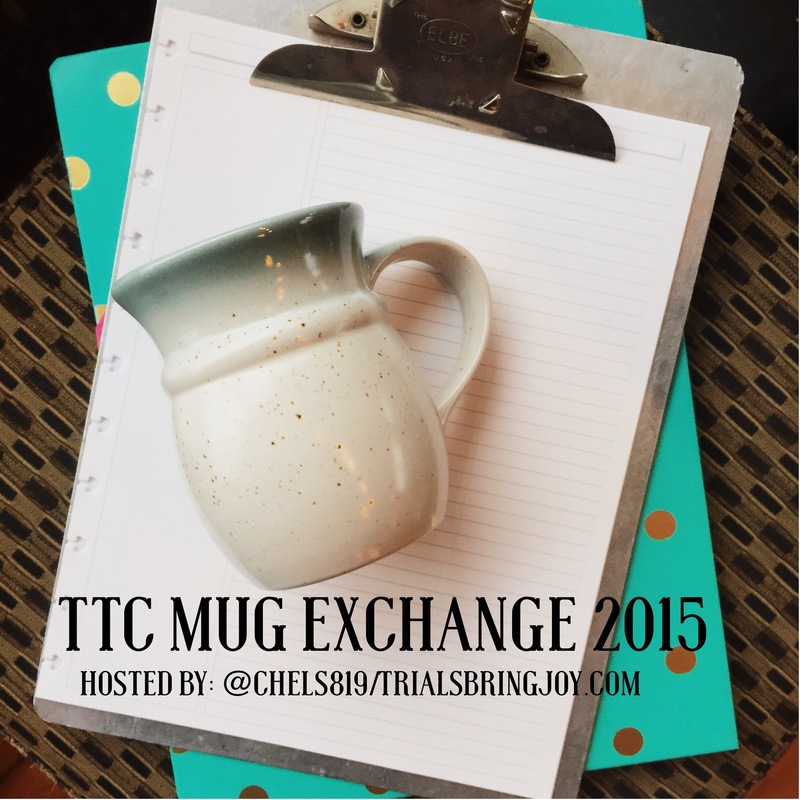 Again, use #TTCMugExchange2015 to share – the more the merrier! That’s it guys! I am so excited for this. These exchanges are among the highlight of my year. YIPPEE!!!! guest post: natalie brenner writes. I love that you do this! What a great way to encourage others! Here from Brun in the Oven! I just signed up and am so excited for this! Thank you for the incredible amount of work you do to put this all together! Yay have been eagerly waiting for the new one to start! I love these so much – 100% appreciate the time and effort you put into this! <3. You are awesome! So much effort, it is a wonderful idea. I am one of the people that are in Australia. I am just wondering if I can do something like say my preference is within Australia (pretty much only because there is less chance of things getting broken or lost if you aren’t sending internationally), but I am happy to do overseas as a second preference? So excited to join in again this year for Chelsea’s TTC mug exchange! Chelsea puts so much work into doing this for us and it’s so great connecting on a more personal level with someone. Hope you’ll join us!